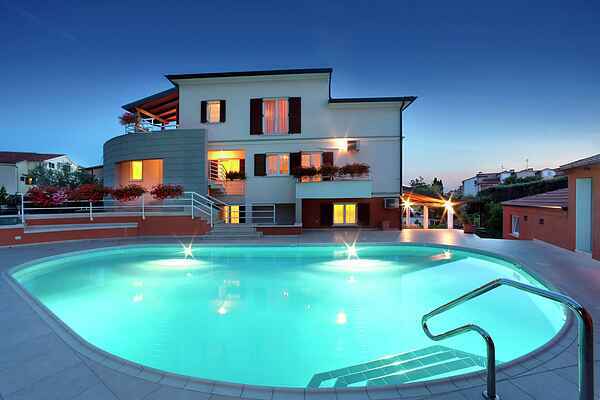 Modern equiped three bedroom apartment with balcony and shared pool, near Porec The apartment Irena VI has two floors. There are three bedrooms (one room with double bed and single bed and two double rooms), fully equipped kitchen, living room with sofabed for two persons and two bathrooms. In the house there is LCD TV, satellite, air conditioning, washing machine and WLAN. Apartment has bed linen and towels, as well as a balcony with garden furniture and private parking. In the house there is a shared laundry room that you can use when needed with an extra charge.